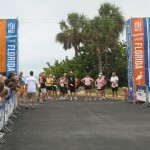 A couple of weeks ago, I wrote about Running Across Florida. 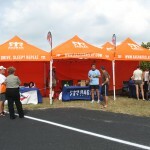 I am here in Clearwater, Florida, at the inaugural 2008 MyoMed Ragnar Relay Florida. Today we sat at the starting line and met the more than 60 teams who have come here to run the 191 miles across Florida to Daytona Beach. 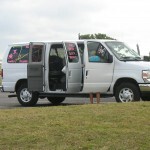 We were able to share a bit about who Operation Kids is and how it helps Ragnar and its runners contribute money to local youth health and fitness programs – which, for this race, is Big Brothers Big Sisters of Florida. It is exciting to tell the runners that 100% of their donations stay local and go to help programs such as the BBBS’ sports buddies program. Thomas Bassano, the elite distance runner who is runing the entire 191 miles solo, started the race at midnight last night. The other teams started at intervals between 8 a.m. and 2 p.m., depending on their pre-race pace times. 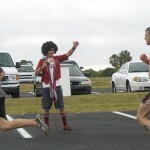 They came decked out in wigs, costumes and high tech running gear – celebrating the crazy and the competitive. Tomorrow we will make the drive to Daytona Beach to continue to help raise money and to cheer on the teams as they cross the finish line. Those of you unfamiliar with the race should check out a short YouTube video of this year’s Wasatch Back race here to get an idea of why this race is so popular – and why we see it as a great way to help promote youth and fitness. Here are a few photos of the day. I’ll be back with updates after Daytona! 12 People. 2 Vans. 191 miles. 24 Hours. The starting line for the first group out. This entry was posted on Friday, November 14th, 2008 at 7:24 pm	and is filed under Events. You can follow any responses to this entry through the RSS 2.0 feed. You can leave a response, or trackback from your own site. We had an absolute blast!!!! I think they were lucky to have no major problems though. There needs to be better organization and monitoring of the exchange points/volunteers. There were at least 5 unmanned exchange points we passed. Teams could have too easily cheated! Maybe you can get local organizations involved in the volunteering for Operation Kids as a part of their service (junior Leagues, Boy Scout groups, etc….). Please pass on the word!